Senior Simran Israni won a $750 scholarship and a Kindle after placing second in the Rancho Santa Fe Literary Society's contest for her essay, Quintessential America. 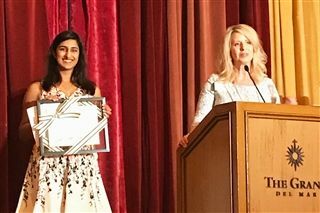 Simran and the other winners met with Ghanaian-American novelist Yaa Gyasi on May 18 at the Fairmont Grand Del Mar during a literary luncheon. Gyasi won the National Book Critics Circle's John Leonard Award for her debut novel, Homegoing. Simran plans to study Business Marketing at Northeastern University in the fall.